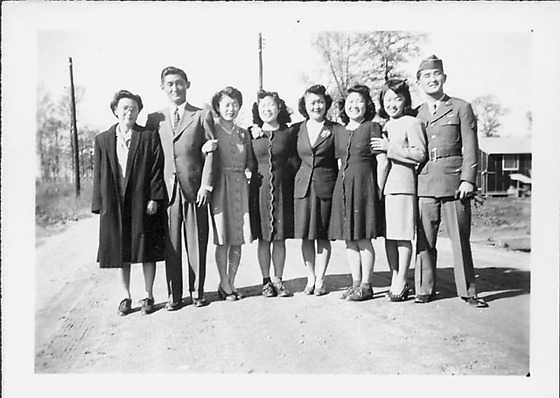 Group portrait of a man in United States Army corporal uniform standing on dirt road with six woman and another man in a suit at Rohwer concentration camp, Rohwer, Arkansas, May 15, 1945. Older woman in dark overcoat stands at far left next to man in suit; five women stand in row in center; soldier holding gloves in proper left hand stands at far right. The soldier wears belted jacket over light colored shirt and necktie, slacks and garrrison hat; two corporal stripes on proper left sleeve. Stampe in black ink on back, BRC: MAY 15 1945.